Finally! 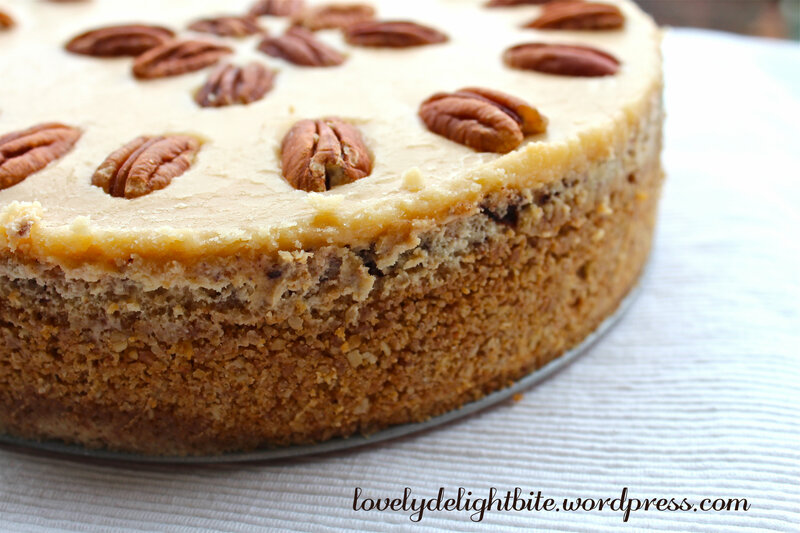 Super riche vegan Cheesecake! I wasn’t so sure how this will turn out. Will the paper forms come off easy? 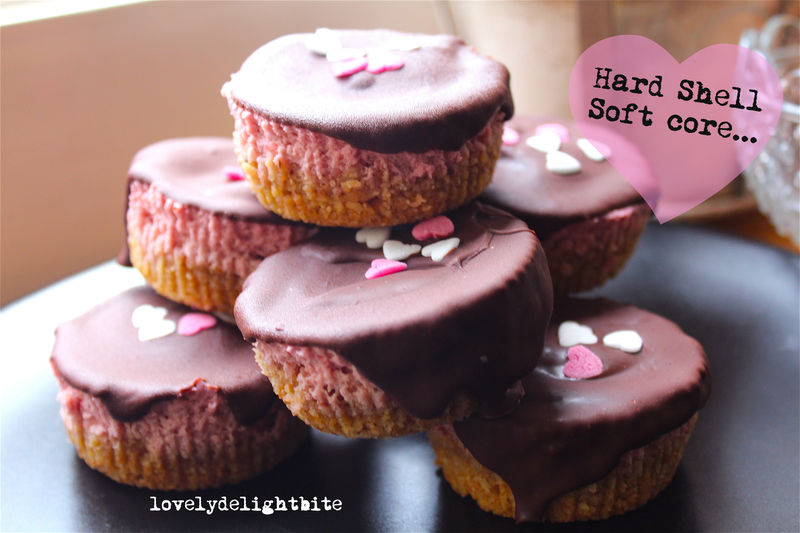 Will the little cakes be solid enough? Cake worries…. for nothing! I am obsessed with making Mini Cheesecakes! This weekend I had 2 invitations. 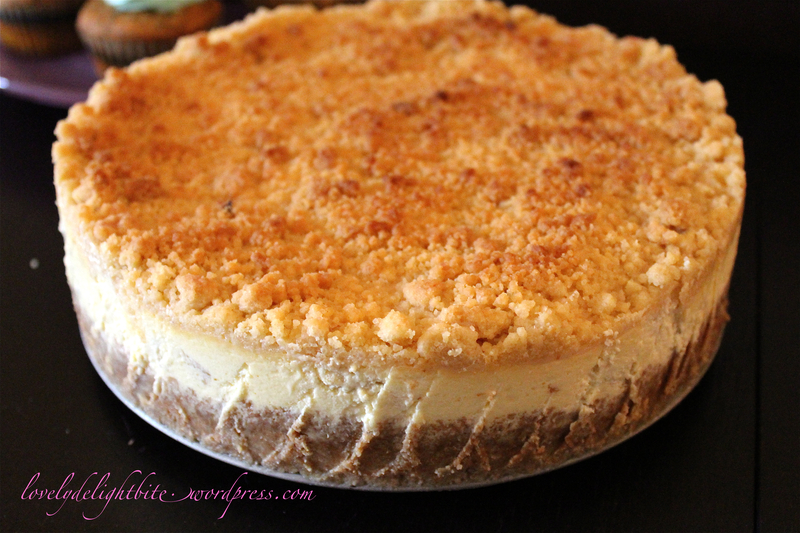 I made the amount of one big cheesecake on friday afternoon and brought half of the goodies to the saturday night dinner with family, the other half I froze and brought them with me to a birthday brunch on sunday. You just prepare your muffin tray with muffin paper forms and the recipe can start! You can keep them fresh in your fridge for 3 days. I just froze them for that short time to test, if they are still as good afterwards. They are! Just freeze them in a tupperware and the flavors are save. 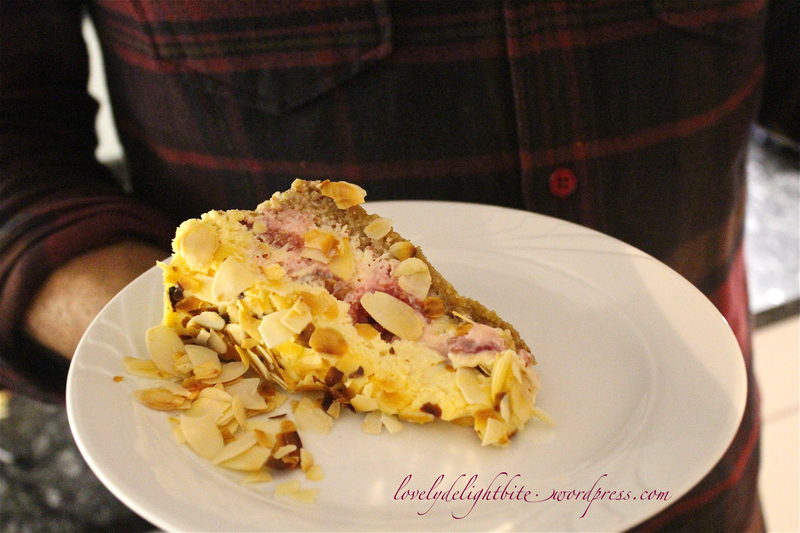 I made my Cheesecake basic recipe, and then went on to create raspberry-Chocolate flavors. That’s the cool thing about it: after making the base, you can really just create the flavors you desire, mix in fruits, nuts, caramel, vanilla, chocolate, what every makes you happy! 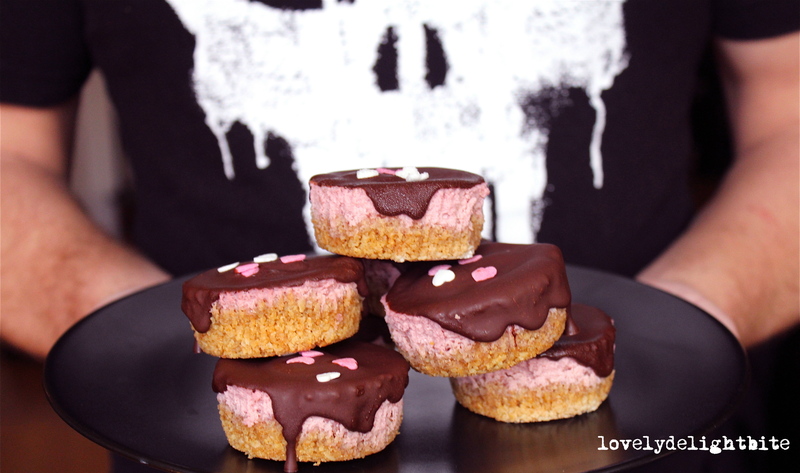 And yes…even skull – shirt wearing rockers love little pink tarts. 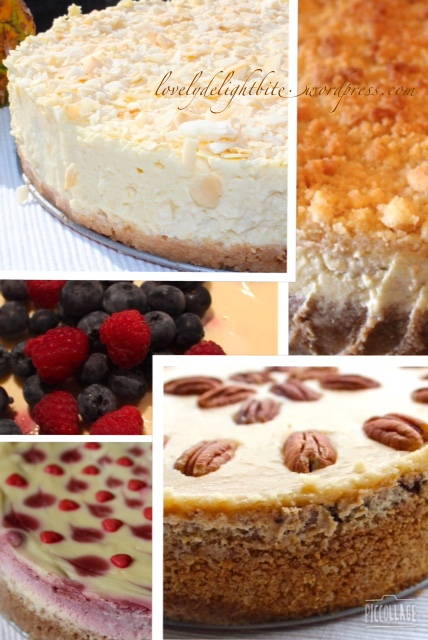 I’m just stopping by to say Hi and also to tell you that I am not sorry, but this Cheesecake-Mania on my Page will probably continue, as it is still the most wanted Dessert at every Party. 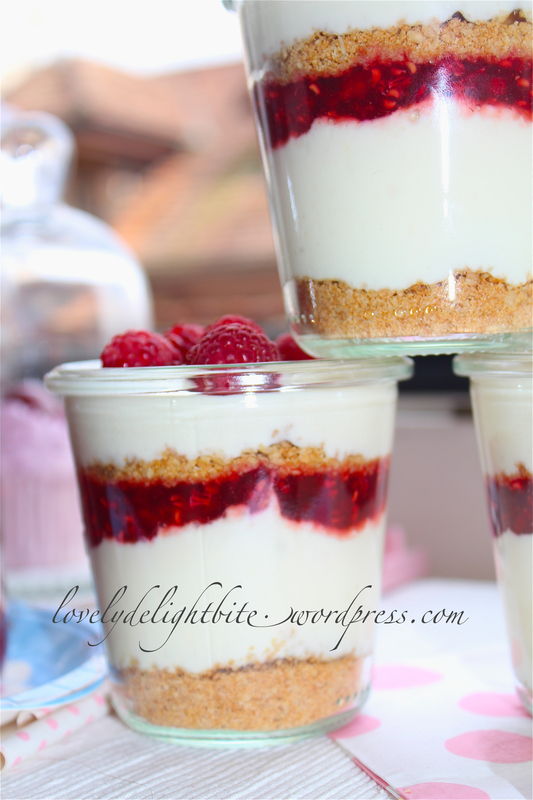 I might promise though to stop making them with Raspberries, as it seems a bit uncreative…. (uncreative maybe, but freakin’ delicious!) 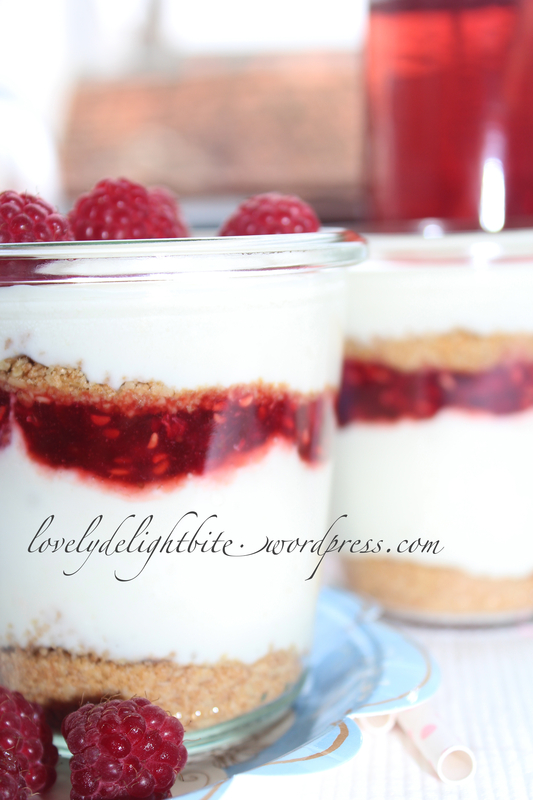 But before I want to promise this: Here my hopefully last Raspberry Cheesecake (for a while). 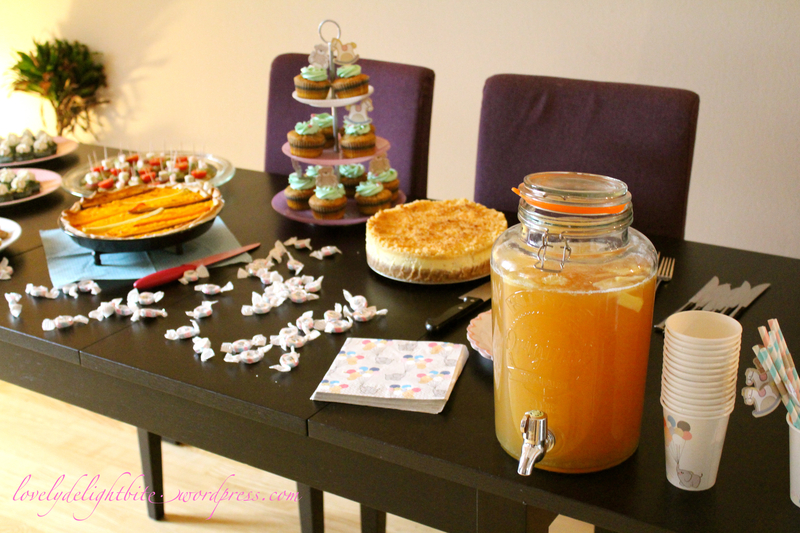 A great sunday to you and until next time with two super yummie guest post recipes! In Switzerland we actually don’t have such thing as baby shower (or bridal shower, just the normal showers you take every morning). My best friend is pregnant since 8 months. And while seeing this miracle growing I got aware that we do not at all celebrate our Mothers-to-be enough in this country. As I love hosting parties and didn’t have to reinvent the wheel, this was the perfect moment to throw my Anna and her little Baby Boy a Baby Shower. Time to shower her with love! And of course shower everyone with delicious food, what else! One of the desserts was my Caramel Apple Cheesecake with Crumble. Click Here to see the Recipe. 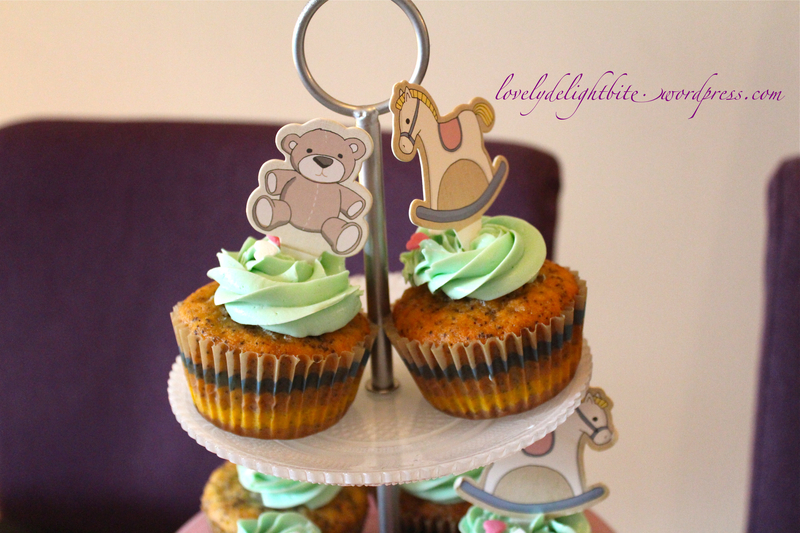 An other oldie but goldie I made, were my Marzipan Poppy Seed Cupcakes. Click Here for the Recipe. For the Salty Flavors I made a Pumpkin-Carrot Quiche and the Spinach-Feta Muffins with Cream Cheese Frosting I make for almost every Party. 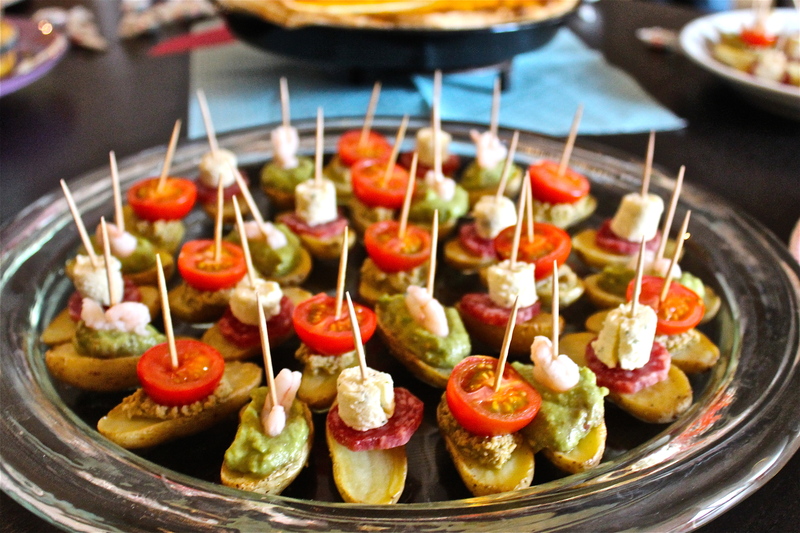 And my newest little fun creation were my Potato Skewers. All you do is you bake the halved Potatoes with some oil and Salt, cool them off and then layer delicious toppings on them. It’s also a lovely glutenfree option or if you don’t eat bread for any other reason. For the Non- alcoholic drink I made a Ginger – Apple Lemonde. All you do is grade fresh Ginger and cut some more in to slices. Poor some hot Water over it, mix it with Lime Juice and Honey and but it aside. Then you mix it with organic Apple Juice and some bubbly Water. You can serve this Beverage cold or also warm like a Punch. It was a wonderful afternoon with all these great woman and I can’t wait to finally meet him! I wish you all a great weekend! 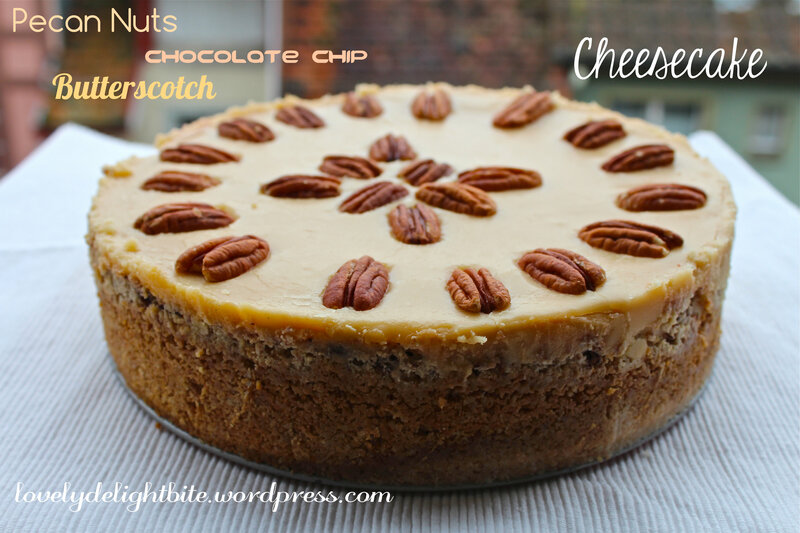 After I found out how easy it actually is to make Cheesecakes it’s my Nr.1 Dessert to bring to a Party (Also because of that Cheesecake Love so many people have). 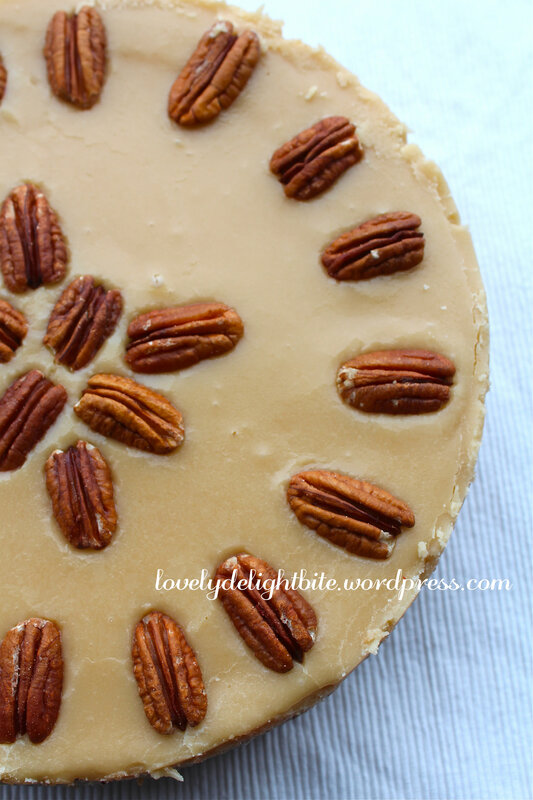 If you enjoy these tastes you will love this Dessert! 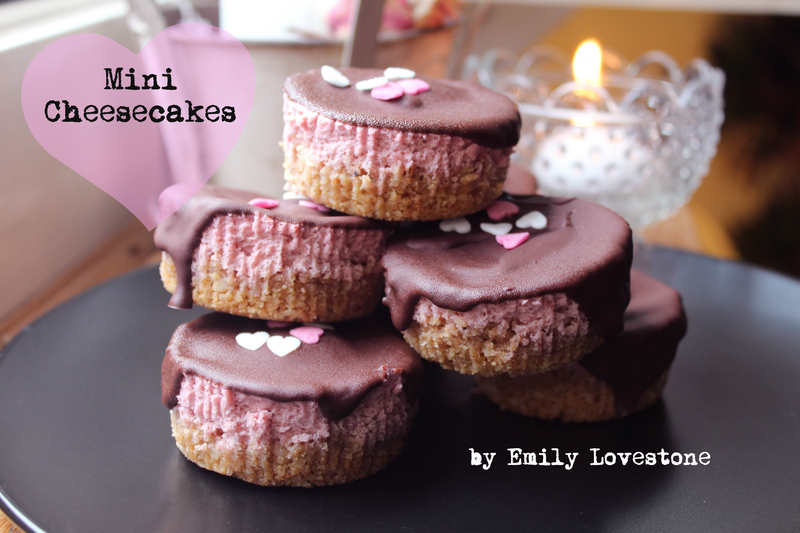 I was inspired by a book from The Hummingbird bakery (Thanks to Steffi!) The only change I made is that I added some Chocolate pieces. 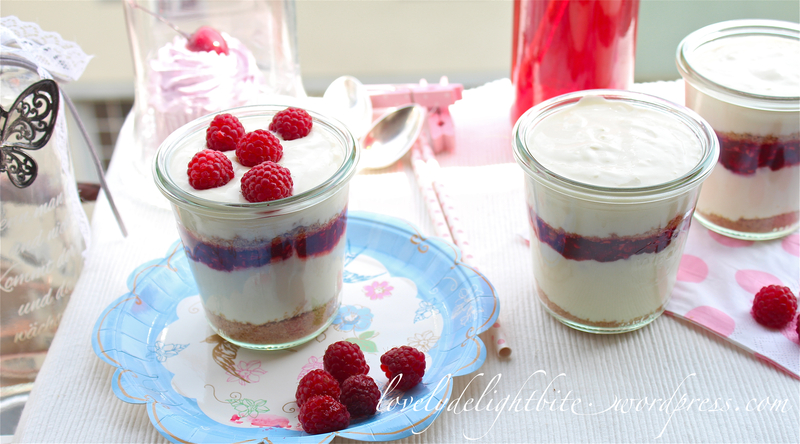 Find this Recipe Here or go to “Desserts” and enjoy! Exactly one year ago this blog baby was born. Happy 1.Birthday! After writing so many Recipes on paper and post-its for friends that asked me, after I have cooked for them, I knew there most be an easier solution. So my cooking passion led me to wordpress and wordpress led me to many youtube tutorial videos and (another) new food blog was born. The only motto for this blog: Easy to prepare with fresh quality ingredients and recipe ideas mostly created by myself with influence from all over the world. And with my blog journey the feedbacks came. Thank you for all the enthusiastic and of course also critical feedbacks (Some thought I was posting too much, for some it wasn’t enough, some people got irritated by vegan recipes, some wished for more meat dishes…..my conclusion: I think there is a Recipe for everyone). And guess what? This blog and I will continue to surprise you with new and hopefully inspiring dishes to just look at or recreate. Thank you for following or visiting my Blog! 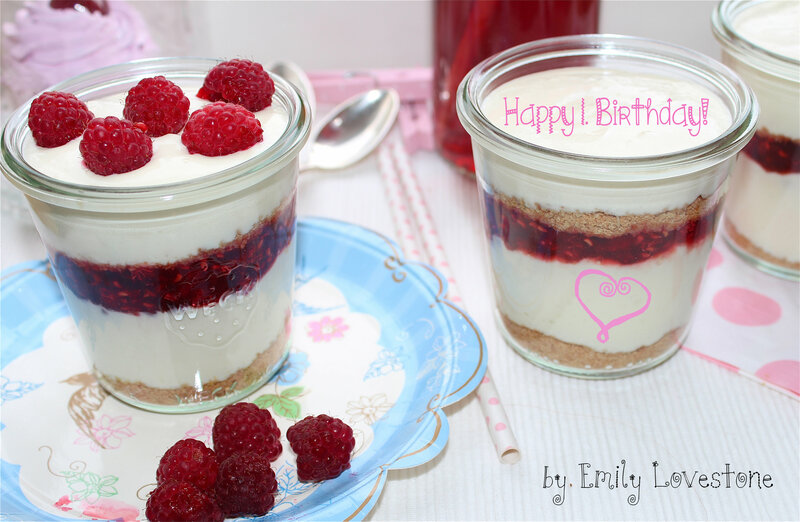 My todays Birthday post: Fast and easy Raspberry Cheesecake in a glass.